While many smaller VoIP companies are often not as good as they claim to be, sometimes comes a true gem, showing the market’s giants that their reign are not safe. Enter MightyCall, a Seattle-based company that provides outstanding services with some major, very surprising twists. While MightyCall comes across as a newcomer, the company’s history goes back all the way to 1999 when VoIP came to be. As a MightyCall user you not only get many of the most important features (even in the demo version), but you can enjoy a system with extras even bigger companies will be proud to boast about. Built-in softphone, an advanced internal messaging system, business texting, integration of numerous third-party solutions, a handy app and a brutally simple and logical system manager all under one subscription, which can be extended or cancelled any time you wish. And if we take into consideration other outstanding features like the extras, the customer support and many more, we would not be surprised if you said: this could be the cloud phone system provider of my dreams. 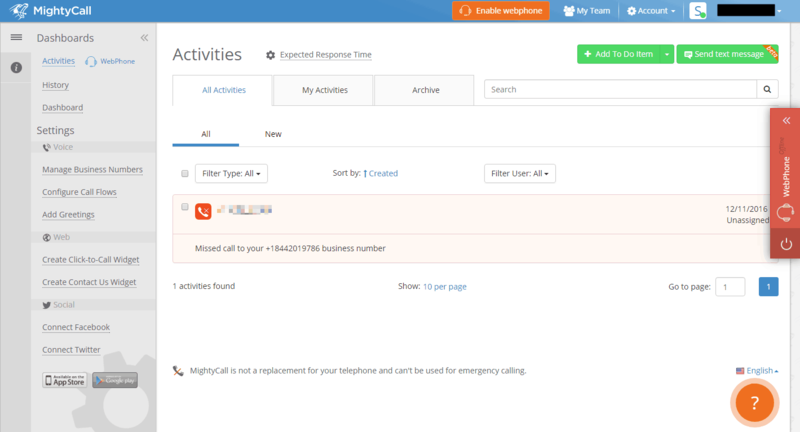 MightCall provides the most important call handling features a decent cloud phone system needs, even including HD voice. As always, you can forward your calls to any phone number you want, provide up to 3 different numbers with the follow-me find-me feature or set up sequential or simultaneous ringing. 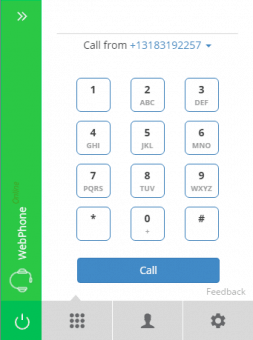 All of the calls are screened on your devices (meaning no hidden numbers), while you can make calls from any device connected to your system using your business phone number. You have the option to record your calls as well (both inbound and outbound), but to do this, you have to pay an extra $15 per month. As for the callers, you can send them to a queue or allow them to either go through the interactive voice menu (where they have to press keys to reach a designated extension) or dial a preferred co-worker by his/her name. Speaking of extensions, you can have as many as you want and associate them to anyone in your phone system. Unfortunately some of the more interesting features cannot be used directly from desk phones, only from a softphone or the mobile app. One such feature is the Telephony User Interface (TUI), a manager that allows you and your co-workers to transfer, hold, merge or disconnect calls and even jump between the first and second line they are using. The TUI is also the place where you can initiate voice-only conference calls either by merging several calls into one or by creating a so-called consultation call. 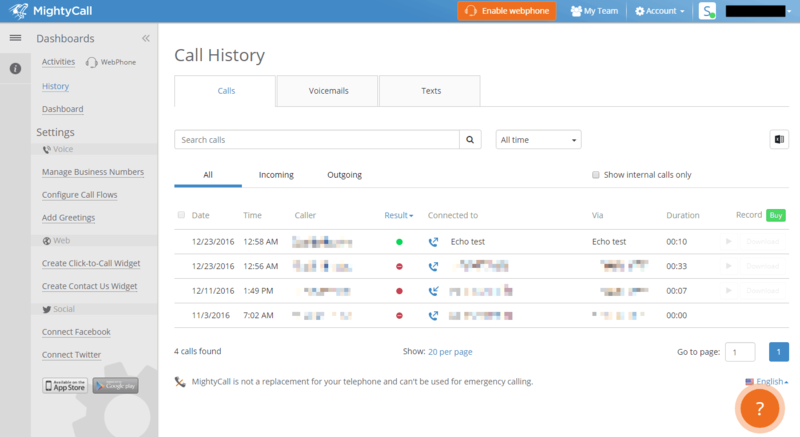 While the call handling features are fine, though not extraordinary, the phone system manager is the part where MightyCall truly shines. Despite being a tad slow and placing some functions illogically, the manager itself is extremely simple and brutally straightforward. Here you can see all call activities, check your call history, voicemails and text messages, and go through detailed call statistics that can be exported to Excel charts. You can also manage your phone numbers and customize your greetings. The latter can be done in two ways: you can either upload one from your computer or (quite interestingly) receive a phone call from MightyCall and get it recorded immediately. Adding team members is also pretty easy: it only requires providing a name, an email address, a forwarding number, an extension and a role (user or administrator), after which you have the option to add the new member to a group. Each member can further customize their account: they can change personal details, provide a forwarding number, set up answering rules and customized greetings, and allow functions like dial-by-name, incoming call screening and sharing voicemails via activity messages. As for the built-in softphone; it perfectly substitutes desk phones, but cannot transmit audiovisual calls and occupies a significant amount of space on the main screen (unless opened in a separate window), even when it is not used. However, without doubt the most advanced feature is the answering rule manager. First, answering rules are visually displayed, allowing you to immediately understand the rules like if it were a true flowchart. 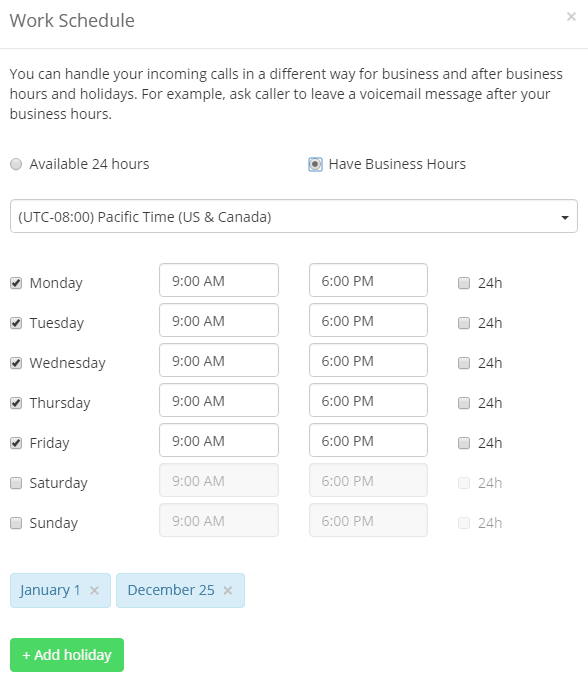 Second, you have virtually endless customization options: you can set up which numbers should be blocked, accepted or prioritized (VIP numbers), determine your business hours (with holidays), which greeting should be played and to which co-worker/voicemail should the call be directed to. 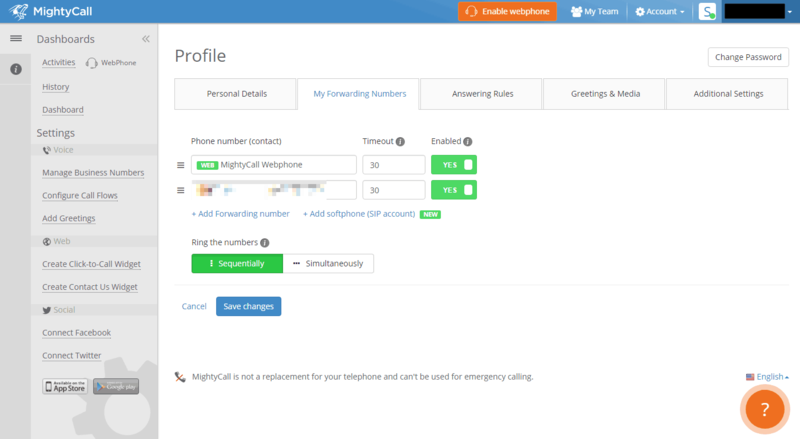 Quite interestingly, the built-in softphone and the clever answering rule manager are not the only specialties of MightyCall. The most notable feature is the to-do function: this is basically an instant messaging platform with which you can send messages/tasks and email reply/call back requests to anyone you like – from your co-workers to your clients. You are also able to send and receive up to a maximum 5,000 business related text messages, albeit this feature is limited to local MightyCall phone numbers. 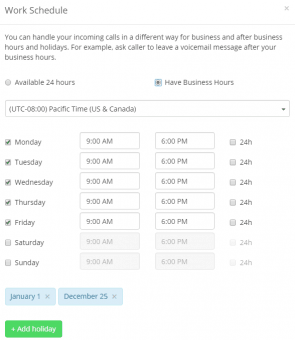 The company also allows you to send emails directly to your account (and turn it into an activity) and to customize your click-to-call widgets (with which callers can request a call back). However, said widget is child’s play compared to the contact us widget which can display your company info complete with email addresses, opening hours, a map and, of course, your phone number. You can also connect your Facebook and Twitter feed to your account and track your social media activities by alerting you in the system manager’s activity feed. And last, but not least, you have the option to purchase extras, including the above mentioned call recording, additional business texts and phone numbers, voicemail transcription, and international numbers. Selecting a phone number is very easy: whether you are associating a completely new number to your MightyCall account or you port your number, the setup is free (which is true for cancelling your account as well). In fact, number porting is also completely free of charge, and you get a temporary number until your old one is acquired (which can take up to 14 days). If you want a new phone number, you can add as many as you can, provided that you don’t exceed the maximum amount of numbers your subscription allows. New numbers can be anything from local to toll-free (vanity) numbers, but unfortunately true 800 numbers are completely excluded. As for international numbers, they can only be associated to your system once it is up and running. Furthermore, they are extras, therefore you have to purchase them separately: they cost $10 per month per number. Despite being able to access your account using a mobile browser, it is not recommended for two reasons: the account doesn’t adapt to mobile screens well, plus you have the iPhone/Android app with all of the most important features your regular account has. 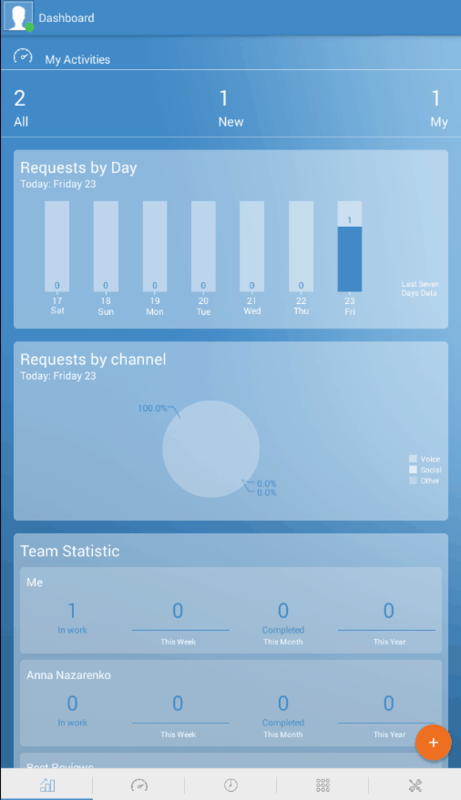 Quite surprisingly the app’s main screen is not the dialer, but the activity feed which even has nice-looking charts and statistics. In the app we can also check the account and our own activity, the call/voicemail/business text history, and finally the dialer. What’s more important is that the app allows you to decide whether you want to make calls using the business number, your cell phone number or the softphone. Furthermore, MightyCall’s most interesting features – such as the to-do items, text messaging and sending an email request – are not only available from this app, but they can be easily accessed from a quick button too. Like we said before, MightyCall’s built-in softphone is far from perfect. The company probably knows that, so it’s not surprising you are able to integrate up to 6 different third-party softphones to your system: X-Lite, 3CX 6, Linphone, Zoiper, Blink and Bria. 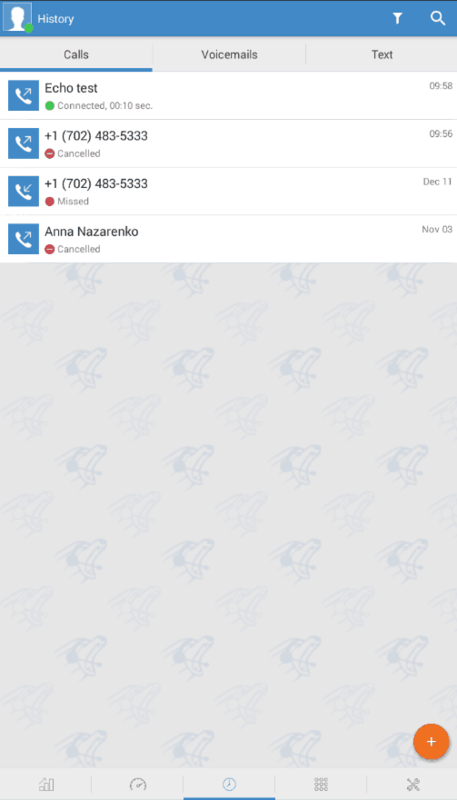 CounterPath’s softphone, which is available for Windows and Mac, is the toned-down version of the company’s other solution, Bria. 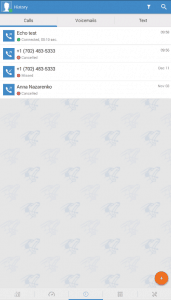 However, it still features the most important functions like SD audiovisual calls, instant messaging, and contact list and voicemail support. This softphone is not only supported by all major platforms (including iOS, Android and Linux), but it also barely uses your device’s CPU and encrypts all your communication, thus enabling secure audiovisual calling and instant messaging. Despite being open-source, Linphone is available to all OSs (including Windows Phone) while you can still enjoy all benefits of a softphone, including HD audiovisual call, conferences, instant messaging and even call logs. There are only 3 subscription plans with monthly or annual payment options (with the latter providing an up to 30% discount), but you have to be careful, because there are major differences between the plans. The most simple plan is Basic, which is $14.92 per month on an annual plan ($19.99 per month on a monthly plan), but call queuing, the softphone, business texting, widgets, special emailing and social media tracking are not included. Furthermore, it only allows 2 users to use 1 phone number and 500 free minutes. The Standard plan ($37.49 per month paid annually) has almost every feature and allows more users to speak for free for more using more numbers, but the best plan is definitely Ultimate. For $69.95 per month (on the annual plan) you have all features, 10,000 free minutes, 5 phone numbers and up to 25 users. However, regardless of your choice, all plans allow you to try the services risk-free for 30 days (with a money back guarantee) and to purchase extra numbers ($5 per month), an international number ($10 per month), call recording ($15 per month), voicemail transcription ($10 per month) and 250 extra business texts ($15 per month). MightyCall also provides a demo through which you can try all the features of a real account without signing up for an account. The demo dashboard lets you access everything, including the activity feed, the call history, the call flow manager and the widgets. Furthermore, you have the option to make certain modifications to your liking, even in the fake profile section. You won’t find this demo publicly listed on MightyCall’s website, though it is free to access for everyone. MightyCall’s customer support is nothing special, but at least it provides everything a client needs. You can contact the company’s staff directly via phone, email (through support tickets) and live chat during business hours. 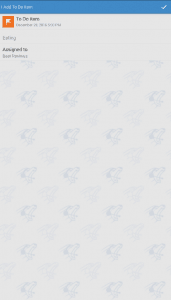 You can also go to MightyCall’s Facebook or Twitter page: even though these pages are mostly used for advertising purposes, you can leave a message to get a prompt response to your questions. If you prefer indirect contact, you have two options. You can visit MightyCall’s blog with interesting articles about marketing and business tips in general. However, if you have general questions related to the service itself, or you want to troubleshoot something, then MightyCall’s help center is the place you are looking for. Here you can find detailed info about the most important features, the widgets and mobile apps. Furthermore, you can read tips about how to set up a third-party softphone and your account in general, how to purchase add-ons and what the international rates are. We won’t say MightyCall is perfect, but we are impressed by what this VoIP system is capable of. Thankfully, the company has only a few duds: users of smaller plans cannot enjoy the most interesting features, as there are considerable differences between the pricing plans. The built-in softphone is a bit disappointing since it only allows voice-only calls, while international numbers can only be associated to accounts as extra. However, the other features are truly amazing. 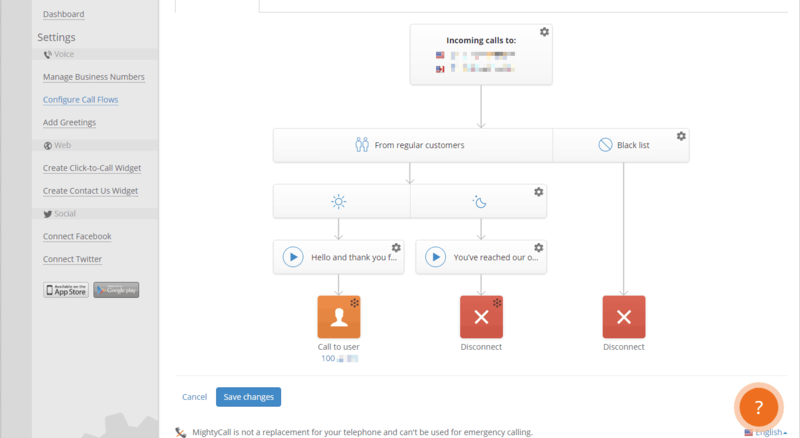 Whether you subscribe or give MightyCall a try via a demo, you get all major call handling features which you can manage from a very clever and logical system manager with a great activity feed. Plus, not every phone system company provides you a perfect answering rule set up function, business texting, a handy app, integration options, and extras like web widgets and a social media tracker. In other words, if you want a reliable, clever, cost-friendly cloud phone system provider, MightyCall should be one of your top choices. Works great… when it works. But then, it OFTEN does not. Glitches all the time. 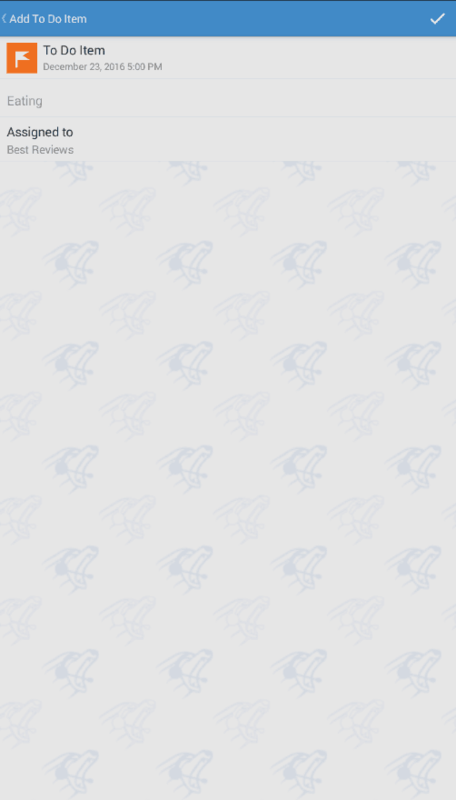 Shows that calls are accepted by someone when they are not, messes up the flow, etc. And customer service is utterly useless. They do not pick up the phone, they do not call back, they take weeks to answer repeated emails requesting help, even when it is extremely urgent, and when they do answer, they blame the customer for problems in the system. Have been using it for a year, and if it weren’t for the mind-boggling inefficiency and lack of customer support, I’d be quite happy with all the functionalities.